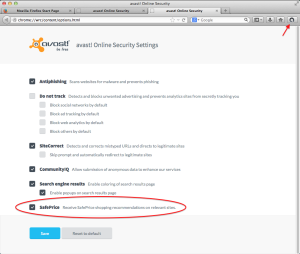 The Safe Mac » Avast installs adware! It would appear that Avast has joined the ranks of adware peddlers, as reader Fred Maxwell brought to my attention yesterday. Sometime around December of last year, a SafePrice option was quietly added to the avast! Online Security browser extension. This extension is available for Chrome and Firefox, but apparently not for Safari as far as I can tell. The avast! 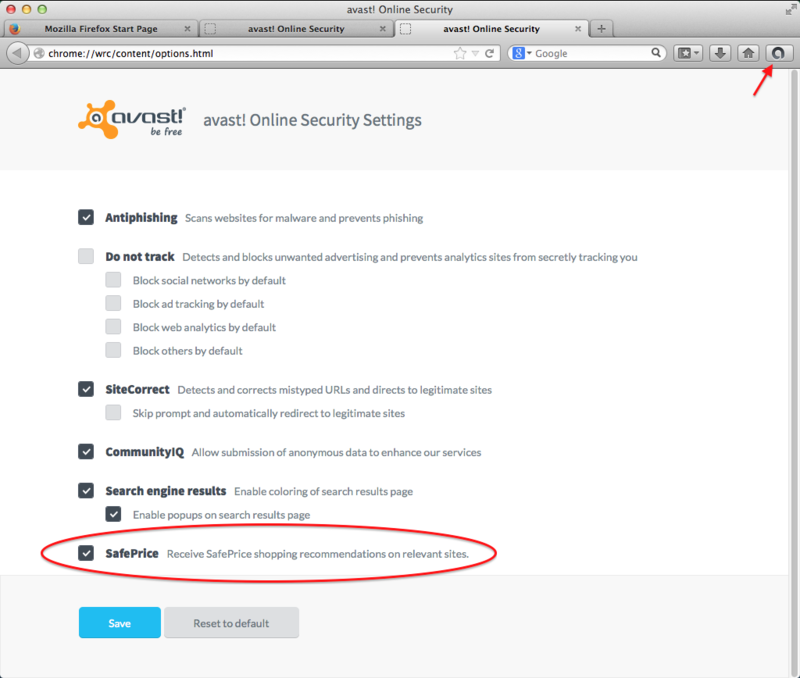 Online Security extension is installed automatically in both Chrome and Firefox when avast! Free Antivirus for Mac is installed. The new SafePrice option, shown at right in Firefox, is enabled by default. When SafePrice is initially installed, you are shown a welcome layer which explains SafePrice’s functions, including how to permanently deactivate it. However, when I installed Avast on a test system, I did not see precisely what they claimed. I did see an Avast page load when I opened Chrome, and this page did mention SafePrice in a list of new changes. However, nowhere on that page was I given instructions on how to permanently disable it. I also checked the license agreement that the Avast installer required me to agree to. Nowhere in that document was SafePrice mentioned, so a user who reads license agreements would have no idea that adware was being installed. The advertising rears its ugly head when the user is shopping on certain sites. (Which sites, I’m not really sure… Avast simply refers to “participating trusted shops.”) A banner is added to the top of the page informing the user that a better price has been found. Despite Avast’s claims of sites “participating,” I have a hard time believing that Amazon would be all that thrilled to see a potential sale being directed away to eBay! And although many users might like to see a cheaper price, most would prefer not to have potentially biased recommendations being made by adware. I understand that it can be a difficult business model to provide free software. Sometimes, free software is ad-supported, and that’s fine. But there are some problems here. First, these are not just product promotions being displayed to the user. These are banners being injected into legit websites, directing users away from those sites and to other sites. Further, Avast is security software. There are serious ethical issues with them recommending certain shopping sites over others, especially when they are not a company with any demonstrable expertise in the area of online shopping. A security company should confine itself to judgements of whether a particular site is a safe place to shop. If they get paid to direct users to a particular site, that is a serious conflict of interest! Finally, adware is becoming a serious scourge, and anti-virus apps should concern themselves with the removal of such nuisances. They should not join in the melee. I had some serious qualms about Avast already. Namely, a tendency towards false positives, including a particular system file that has been sporadically identified as a “decompression bomb” repeatedly since at least 2009. However, including adware in their anti-virus software really crosses the line. At this point, I strongly recommend that you uninstall Avast, if you have it installed. Be sure to use the most recent Avast uninstaller to properly remove all components of this software. Lest anyone think that this only applies to the Mac version of avast! Free Antivirus, the Windows version has “SafePrice” bundled as well. The official avast! blog page to which this article links has a comment from a Windows user who walks through the installation process for Windows on YouTube, and the video shows that SafePrice is installed on Windows as well. It’s important to note that, at least based on that video showing Windows installation, “SafePrice” is not mentioned at all in the installer. It only says “Browser protection,” because SafePrice is a feature of the browser safety extension (which is also supposed to provide anti-phishing, etc.). The YouTube video doesn’t show whether or not you can disable the SafePrice feature of the browser extension on Windows, although I presume it’s possible since it’s possible on Mac (as seen in a screenshot in this article). I’m hesitant to accuse an antivirus company of distributing adware, but what else could this be called? 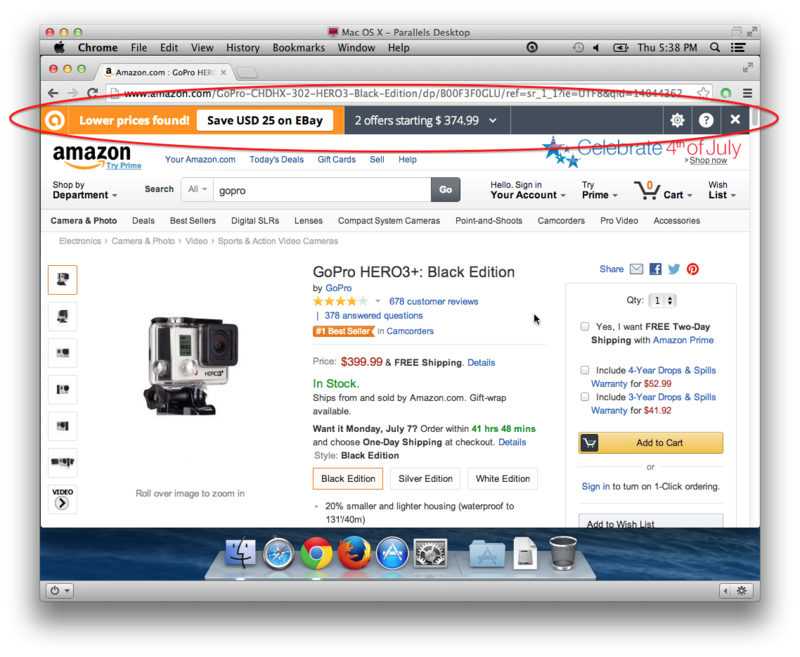 It displays intrusive advertisements that disrupt your online shopping experience, as seen in the Amazon screenshot in this article. As for the article’s mention of “participating trusted shops,” I think avast! is describing sites that have paid to be promoted in SafePrice advertisements (as opposed to the sites you visit being “participating…shops”). Obviously, as this article points out, Amazon wouldn’t want you to go elsewhere and purchase a product on eBay instead. In that case, the “participating trusted shop” is eBay, not Amazon. I have Avast! on my windows computer from a long time ago (not the free one). This is troubling. I won’t use them again. It is so difficult to tell which anti-virus is reputable. I don’t know if other anti-viruses like Intego do the same thing. It would be nice to somehow have a list of good anti-virus apps (i.e. good anti-virus apps which are free and don’t have adware bundled into them) on a website so one could check if in doubt. But thank god that this website exists or else I would be completely lost in terms of adware, anti-virus, and technical aspects of the mac. This website is a godsend. Removed Avast and installed Sophos. The only oddity with Sophos is the virus definition updates are very large, like over 100mb every time. So you would not want to update over cellular. 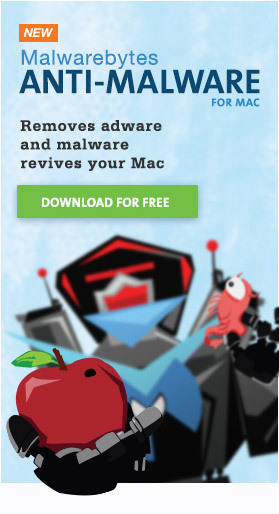 Please let Avast know that you (we) disapprove of them bundling adware like this. AND, share your disapproval by saying so in the survey that comes up when you uninstall Avast Antivirus. It appears on Amazon. I uninstalled Avast and the ads weren’t there anymore. I’ve gone back to ClamavX. I too loaded Avast quite some time ago after reading tons of good reviews of the program on reliable sites and forums. Earlier this week a page popped up when I opened Chrome that looked like an Avast settings page asking me to confirm my various security settings. From then on I got redirected to Yahoo every time I opened Chrome. The same thing happened with Firefox. I unloaded Avast and then found that my home page had been changed to ms.speedial . . . . . . which redirected me to Yahoo. What a pain. Unreal that Avast had the chutzpah to play this game. Avast is a fraud. I found I had installed Genio when looking at Avast and then found Safari would not load because of a problem with a Genio file clashing with Trusteer Rapport system. Raport directed me to The Safe Mac and the Adware removal Tool removed the Genio system. I will be taking great care to keep clear of Avast. Thank you for the Removal tool. I tried to install avast anti-virus on my mac based on your testing report for 2014 which showed it performed well in detecting. But on install it told me am using ClamXav and I need to uninstall that first to have avast installed. That sounds a bit odd to me. What’s avast trying to hide from ClamXav? Why would it have problem with ClamXav on my mac, it doesn’t even do realtime protection. ClamXav gets along well with all but a couple of other A-V scanners and Avast! is one of them. It has been known to identify some ClamXav signature update files as infected, probably because they use the same signature for a given infection. A workaround might be to tell Avast! to ignore the ClamXav signature database which is located at /local/usr/clamXav/share/clamav/. Seems like that would be an easy fix for the Avast! developer, but I guess not. BTW, there are a couple of other issues with Avast!, even though it does seem to have a high malware detection rate, it also has a high false positive detection rate, so make certain nothing it detects as infected is a critical part of OS X or third party software. It also has been implicated in draining laptop batteries overnight, even when they were supposed to be sleeping. I don’t recall seeing updates this large, but the update process, as well as just scanning data, do eat a lot of resources. I would guess it’s also checking for Windows viruses.. That said, Sophos is a decent, trustworthy vendor. I’ve also had it running on my mail server for years. I have been using Avast for a while. I saw safeprice in the settings tab and turned it off. I’m a bit confused by your question. What is it you want to accomplish by running “Code”? Do you want to remove Avast!, eliminate the adware or something else? I notice they only mention the Chrome extension, not the Firefox or Safari extensions. It would be interesting to test this. Of course, even if the negative publicity has led them to remove this feature from all those extensions, I would still question the wisdom of using software from a company that would be willing to package adware with their software. avast’s safeprice is not doing that and therefor it is not adware as the poster of this article claims it is. You are welcome to your opinion, of course, but if you think that Avast is not getting any compensation for referring customers away from sites like Amazon and to other third-party sites, then you’re fooling yourself. It seems pretty obvious to me that these are advertisements, and that they are generating revenue for Avast. I’m more than willing to pay for legitimate protection, but unfortunately McAfee and Norton just seem to be bloated tools that slow down overall performance? have you had any experience with a good paid security product for Mac? I wouldn’t recommend any paid anti-virus program for the Mac. There’s just no reason to, especially when the vast majority of them are junk for one reason or another. Sometimes free really is free… in this case, ClamXav is completely free, and detects all current Mac malware. So I downloaded avast! to my new mac and now I’m getting suspicious wether I should uninstall it… Is it safe to uninstall the program? Will uninstalling cause any harm to my computer..? Where should I search for the safest uninstalling program? Will I be enough protected with mac’s own OS X? There is no “safest” uninstalling program – any kind of general uninstaller app should never be used at all. When uninstalling software, you should ONLY use the uninstaller provided by the developer of the software being removed. In the case of avast!, open the app, and it can removed through a menu item in the avast! menu. As for how to protect yourself, see my Mac Malware Guide.